Kids enjoying a day of Summer Fun at Robert Moses State Park. Long Island is home to an extensive network of state and town parks many of which are free for residents to enjoy year round. Other parks offer free admission for those who carry a NYS Empire Passport. Whether you have a passion for picnicking, hiking, biking, camping or simply being outdoors with nature to get some fresh air, there are several different parks for you to choose from in both Nassau and Suffolk Counties. Many of the local parks even offer wonderful amenities for families with children. There is also plenty of wildlife surrounding Long Island towns and neighborhoods. Suffolk County is filled with numerous local and state parks for all those family gatherings and picnic days! Sunken Meadow State Park is home to three miles of waterfront on the Long Island Sound, kids can build sandcastles, enjoy dipping their feet in the water or going for a swim with seasonal lifeguard supervision. This park even features a large playground and picnic area for kids to take a break and re-energize with some picnic treats. The area also offers great hiking and bridle trails. Sunken Meadow Park also hosts as a venue for family reunions, parties, and weddings. For families seeking an outdoor gathering, picnic, or informal sports activities, Belmont Lake State Park is the primary location for families to visit. With open fields and playgrounds, the kids can run wild. The park also features boat rentals (from May through October) and hiking and biking trails. Open year round, Blydenburgh Park is a vast 627-acre park with attractions such as camping, fishing, hiking, rowboat rentals and picnicking at the Blydenburgh farm. Kids can also have some fun on the playground. Captree State Park is home to the largest fishing fleet on Long Island and is best known for fishing and its picnicking destination featuring a playground, full service dining and casual dining overlooking Fire Island. This park has boat rentals available for saltwater fishing. There is an area to launch your own boats and a bait and tackle shop for your convenience. This 320-acre site includes campsites open for use by individuals, family, youth group camping and club camping featuring 10 sites with water and electric hookups. Take a walk through nature and experience the beauty of being outdoors. Cedar Point County Park is the perfect place for those who love being outdoors. The park offers camping grounds, fishing areas, boat rentals, play areas and picnic areas. The 607-acre park also has spectacular views of Gardiner's Bay. Located on the Great South Bay, Hecksher Park, offers a variety of outdoor recreational activities on the south shore with its 1600 acres of land. Park visitors will enjoy the various outdoor activities that can be done within the park which include nature trails, camping, and hiking. Visitors can also launch boats, wind surf, paddle board, and kayaking. Located on Long Island's southern tip, Hither Hills State Park offers all the fish you can ask for. The park is also known for a variety of activities that range from hiking and nature trails, hunting, and many aquatic activities, such as windsurfing. This park is on the eastern tip of the South Shore offering scenic view of the Atlantic and the Block Island Sound. Montauk Point is also a location for many water sports such as surfing, wind surfing, and paddleboarding. You might even get the chance to spot some seals sunbathing on the rocks just off the shore. Orient Point's unique bench swings make it a fun Summer destination for kids & adults alike! Orient Point has over 45,000 feet of shorefront on Gardiner's Bay and is home to a rare maritime forest comprised of red cedar, black-jack oak, and prickly pear cactus. The beach is known for relaxing, picnicking and various recreational activities. Visitors can also fish, kayak and paddle board. Robert Moses is another popular ocean beachfront on Fire Island among locals. Visitors and patrons can swim, surf, or fish from the shore or piers. With it’s picnic area and 18-hole “Pitch & Putt,” Robert Moses offers many different activities by the beach for the whole family. Wildwood State Park is made up of 600 acres of undeveloped forest on a high bluff that overlooks the Long Island Sound. Picnickers can relax at one of the shaded picnic tables as children enjoy the nearby playground. Fishing and hiking is also permitted. Nassau County offers some of the best parks for families with children to gather and spend the day outdoors! This 96-acre park offers a lot of space for kids to run and jump around. After working up an appetite, families can sit down for lunch in the picnic area. Bicycle and running paths are available as well as an outdoor roller rink, a 9-hole, par-30 golf course and a sailboat launch ramp and fishing dock. Known mainly as the site for the 2002 and 2009 U.S. Open Championship, Bethpage State Park offers five golf courses. However, this park also offers other amenities including picnic areas, playgrounds, tennis courts and more. Cantiague Park is a 127-acre park and the first park to offer a swimming pool and artificial skating rink. The park also features five lighted tennis courts, three lighted basketball courts. Kids can enjoy the 18-hole miniature golf course while adults can practice their swing at the driving range or on the renovated 9-hole, par-30 golf course. Cantiague Park also has a picnic area with two reserved picnic area and one non-reserved family area. Centennial Park may be a smaller park but has a lot to offer especially for kids. This newly renovated park provides a state-of-the-art playground equipped with eight swings, a climbing apparatus, slides and a dozen basketball hoops and two tennis courts. Water sprinkles are available in season. This 98-acre park is full of activities such as tennis, basketball and volleyball courts as well as baseball fields. Christopher Morley Park also offers trails for those who like to walk or jog. In addition, kids can run around in the large playground with swings and slides. Located on the South Shore of Long Island in Freeport, Cow Harbor Park and Preserve not only serves to protect and display 150 acres of Long Island's marine wetlands but also offers many different courts and playing fields for kids in addition to a one mile jogging course and quarter mile nature trail. Forest City Community Park is located in the town of Hempstead and features a 6,000 square foot L-shaped pool with a diving area at one end. Ponds cover 6 acres of the land and nature trails. Picnic areas, playgrounds and baseball fields are also available. Grant Park is a 35-acre sports oriented park equipped with three basketball courts and three tennis courts. A roller rink is open to the public and in winter is transformed into an ice rink through to Spring. A modern playground area is designed with three areas for three separate age groups. Hempstead Lake State Park offers visitors a variety of amenities, including bridal trails, fishing in three ponds, playgrounds, ball courts and open playing fields. Hewlett Point Park is a small park located on the South Shore featuring sports playing fields, an outdoor pool and wading pool as well as a playground and picnic area. Who doesn't love some friendly competition? 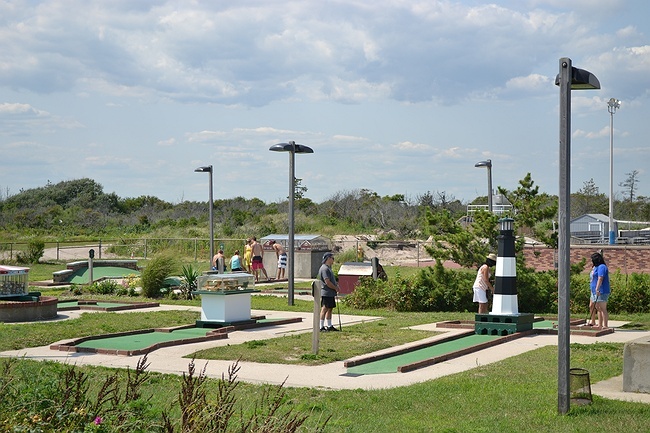 Jones Beach offers just that at its very own mini golf course! Jones Beach State Park is mostly known for its 6.5 miles of ocean beach and is the most popular area for locals to go to on a hot summer day.The beach offers a lot of amenities to visitors which include miniature golf, shuffleboard, playground, basketball courts, concession stands, swimming pool, a performing arts theater with shows all summer, a long boardwalk to walk or jog, and a gift shop. Nickerson Beach is one of the most desirable oceanic destination spots on Long Island. Their family "Fun Zone" is perfect for kids as it now features a state-of-the-art playground, new basketball and volleyball courts, a new baseball field and an exciting new skate park. Swimming pools are available at either end of the park. North Hempstead Beach Park With 34 acres, North Hempstead Beach Park offers many amenities from a fishing pier and boat ramps to basketball courts and handball. The beach also allows for family gatherings for an afternoon picnic or barbecue. Kids can also enjoy the playgrounds and pavilions. Valley Stream State Park is a natural refuge surrounded by heavily residential areas. Children can explore various habitats within the park along two nature trails. The park offers picnic areas with tables, fireplaces and grills and children's play areas.